A NUCLEAR SUMMIT between North Korea’s Kim Jong Un and US President Donald Trump has ended without agreement, according to the White House. “No agreement was reached at this time, but their respective teams look forward to meeting in the future,” White House press secretary Sarah Sanders said in a statement. Still, Sanders is describing the meetings between Trump and Kim as “very good and constructive”. Trump and Kim departed the hotel where they’ve been holding summit negotiations far earlier than planned. In the original White House programme, a joint agreement signing ceremony was scheduled, along with a working lunch for the two leaders. “We just left chairman Kim with a really, I think a very productive time. We thought and I thought and Secretary Pompeo felt that it wasn’t a good thing to be signing anything,” Trump said, speaking to the media shortly after leaving the summit. “We spent pretty all day with Kim Jong Un who is… he’s quite a guy and quite a character and I think our relationship is very strong. At this time we had some options and at this time we decided not to do any of the options and we’ll see where that goes. It was a very interesting two days and I think actually it was a very productive two days but sometimes you have to walk and this was just one of those times. "Some days you just have to walk." Donald Trump speaks after his meeting with Kim Jong Un ended without a deal. From the outset of the trip, Trump had appeared to downplay expectations of an immediate breakthrough in nuclear talks, saying he was in “no rush” to clinch a rapid deal and was content if a pause in missile testing continued. However, he did frequently dangle the prospect of a brighter economic future for a nuclear-free North Korea, at one point saying there was “awesome” potential. The summit has been a far cry from the height of missile-testing tensions in 2017 when Trump slammed Kim as “rocket man” and the younger man branded the American president a “mentally deranged US dotard”. Kim, in an apparently unprecedented move, answered unscripted questions from foreign reporters, saying that he would welcome the establishment of a US liaison office in Pyongyang, which would be a step on the way to diplomatic normalisation. The North Korean leader is looking for relief from sanctions imposed on his country because of its weapons programmes, which saw tensions soar in 2017 before a wave of detente. He said there were “people who hold a sceptical view of our meeting” but pledged to seek “great, ultimately good results”. There were also hopes Kim could pledge to destroy North Korea’s decades-old Yongbyon nuclear complex, which has long been at the heart of Pyongyang’s atomic development but remains shrouded in secrecy. Email “'We had to walk': Donald Trump and Kim Jong Un summit ends with 'no agreement reached'”. 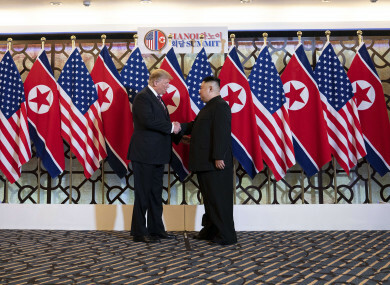 Feedback on “'We had to walk': Donald Trump and Kim Jong Un summit ends with 'no agreement reached'”.